Three people had to be cut out of car and bus after smash on M11 near England’s Stansted Airport. A NUMBER OF people were trapped in their vehicles in a motorway pile-up in England today. 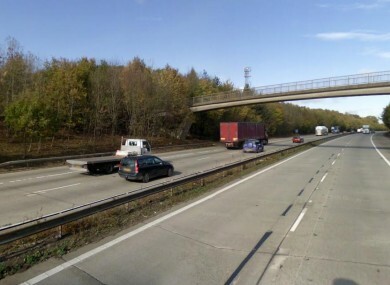 The accident on the M11 near Stansted Airport, which happened just before 10am, is reported to involved at least three lorries, a bus and four cars. Sky News is reporting that both carriageways are closed to traffic, although the incident apparently happened on the northbound route, between junctions eight and nine, Saffron Walden and Bishops Stortford. The BBC says that the hard shoulder is open on the southbound carriageway. The Essex County Fire and Rescue Service is reporting that two people were trapped in the bus, and one in a car. By 11.05am, six emergency crews had arrived at the scene and had rescued the person in the car and one of those trapped in the bus. By 11.45am, they had cut free the third remaining casualty. All casualties have been removed by ambulance and the road remains closed. The BBC said the two people in the bus were a man and woman who both suffered broken legs and were taken to Addenbrooke’s Hospital in Cambridge. A man and woman from two different cars were also taken to hospital with “minor neck injuries”. Email “Pile-up involving eight vehicles closes motorway”. Feedback on “Pile-up involving eight vehicles closes motorway”.